Help is wanted in the small towns and villages of Canada, says Denis Coderre, the country’s Minister of Immigration. Doctors and teachers are needed in remote areas, as well as nurses, engineers, IT experts, electricians and plumbers. Skilled workers from India, Tunisia, Colombia or anywhere else are encouraged to apply to come to Canada and get a job in places like Moose Jaw, Saskatchewan or Stony Mountain, Manitoba. Professional candidates from all over the world are welcome to fill the impending labour shortage in Canada’s regions, says Coderre in an interview with NRC Handelsblad. If Canada fails to recruit more professional immigrants, he says, the country will face a shortage of one million workers in five years. After that, the shortage will become even more acute, because the Canadian population is not growing fast enough to keep up with rapidly aging demographics. The country’s birth rate is low, at 1.52 (children per woman) – comparable to the level in the Netherlands, but well below the 2.08 birth rate in the United States. “By 2009, our labour force will depend on immigration, and by 2026, our population growth will depend on immigration,” said Coderre. He wants to increase the number of immigrants to Canada to at least 300,000 per year – roughly 1 per cent of a population of 30 million. During the last decade, Canada’s annual number of newcomers has fluctuated between 175,000 and 250,000. The proposed increase is supported by Coderre’s party, the governing Liberals, a pro-immigration party that is firmly in power in Canada and has traditionally attracted a lot of votes among newcomers. Canada has no anti-immigration politics to speak of. It’s all good news for job hunters with professional skills in less prosperous countries in the world. There is just one condition: if it is up to Coderre, not all newcomers will settle in the big multicultural cities of Toronto, Montreal and Vancouver. Currently, 81 per cent of immigrants go there. Toronto alone attracted 108,000 newcomers in the year 2000, more than any other city in North America. The Canadian government and the country’s provinces would like to see a better spread. Not to spare Toronto, but to ensure that the skills of highly educated immigrants also benefit smaller towns and villages with less of a magnetic pull to the world’s migrants. Vacancies in those places often stay unfilled for long periods of time. According to his proposal, participants are expected to spend 3 to 5 years working as a temporary worker in a specific job, in a place determined by Immigration Canada. After that, they can become permanent residents – and, eventually, citizens – and are free to go where they want. If all goes according to plan, they will have integrated sufficiently into their new home towns by then to possibly want to stay there. That’s attractive, Coderre reckons, because in the big cities it is not uncommon for immigrant engineers to work in pizza delivery and for physicians to work as nurses or orderlies. However, there is fierce criticism of the plan. A spokesperson for a Chinese-Canadian organization said that the proposal to limit freedom of movement within the country reminded her of communist China. Civil liberty advocates think such restrictions are inconsistent with the Canadian Constitution. Other critics have questions about the practical implications of the idea. Should immigrants who move in breach of their contract be tracked down and deported? Coderre says the details of the plan are still being worked out. But as far as he is concerned, “it’s not a question of coercion, it’s a question of seduction.” There is nothing unconstitutional about the plan, he argues – in fact, temporary work visas already exist under Canadian law. They are being used on a limited scale in agriculture, for foreign workers who come in to harvest crops, for example – usually for periods of 4 to 6 months. 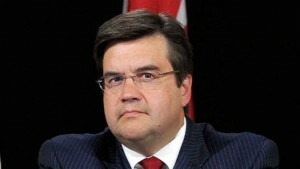 Other critics have compared Coderre’s proposal to the European policy of ‘guest labourers’, with its side effect of creating “underclass ghettoes”.